A manual transmission, or manual gearbox (also informally known as a 'manual', 'stick shift', 'straight shift', 'standard shift', or sometimes [potentially misleadingly] '5-speed') is a type of transmission used in motor vehicle applications. It generally uses a driver-operated clutch, operated by a pedal or lever, for regulating torque transfer from the internal combustion engine to the transmission, and a gear-shift, either operated by hand (as in a car) or by foot (as on a motorcycle). Other types of transmission in mainstream automotive use are the automatic transmission, semi-automatic transmission, and the continuously variable transmission (CVT). Manual transmissions often feature a driver-operated clutch and a movable gear selector. Most automobile manual transmissions allow the driver to select any forward gear ratio ("gear") at any time, but some, such as those commonly mounted on motorcycles and some types of racing cars, only allow the driver to select the next-higher or next-lower gear. This type of transmission is sometimes called a sequential manual transmission. Sequential transmissions are commonly used in auto racing for their ability to make quick shifts. Manual transmissions are characterized by gear ratios that are selectable by locking selected gear pairs to the output shaft inside the transmission. Conversely, most automatic transmissions feature epicyclic (planetary) gearing controlled by brake bands and/or clutch packs to select gear ratio. Automatic transmissions that allow the driver to manually select the current gear are called semi-automatic transmissions. Contemporary automotive manual transmissions are generally available with four to six forward gears and one reverse gear, although manual transmissions have been built with as few as two and as many as eight gears. Tractor units have at least 9 gears and as many as 24. Some manuals are referred to by the number of forward gears they offer (e.g., 5-speed) as a way of distinguishing between automatic or other available manual transmissions. Similarly, a 5-speed automatic transmission is referred to as a "5-speed automatic." The earliest form of a manual transmission is thought to have been invented by Louis-René Panhard and Emile Levassor in the late 19th century. This type of transmission offered multiple gear ratios and, in most cases, reverse. The gears were typically engaged by sliding them on their shafts—hence the term "shifting gears," which required a lot of careful timing and throttle manipulation when shifting, so that the gears would be spinning at roughly the same speed when engaged; otherwise, the teeth would refuse to mesh. These transmissions are called "sliding mesh" transmissions and sometimes called a crash box. Most newer transmissions instead have all gears mesh at all times but allow some gears to rotate freely on their shafts; gears are engaged using sliding-collar dog clutches; these are referred to as "constant-mesh" transmissions. In both types, a particular gear combination can only be engaged when the two parts to engage (either gears or dog clutches) are at the same speed. To shift to a higher gear, the transmission is put in neutral and the engine allowed to slow down until the transmission parts for the next gear are at a proper speed to engage. The vehicle also slows while in neutral and that slows other transmission parts, so the time in neutral depends on the grade, wind, and other such factors. To shift to a lower gear, the transmission is put in neutral and the throttle is used to speed up the engine and thus the relevant transmission parts, to match speeds for engaging the next lower gear. For both upshifts and downshifts, the clutch is released (engaged) while in neutral. Some drivers use the clutch only for starting from a stop, and shifts are done without the clutch. Other drivers will depress (disengage) the clutch, shift to neutral, then engage the clutch momentarily to force transmission parts to match the engine speed, then depress the clutch again to shift to the next gear, a process called double clutching. Double clutching is easier to get smooth, as speeds that are close but not quite matched need to speed up or slow down only transmission parts, whereas with the clutch engaged to the engine, mismatched speeds are fighting the rotational inertia and power of the engine. Even though automobile and light truck transmissions are now almost universally synchronised, transmissions for heavy trucks and machinery, motorcycles, and for dedicated racing are usually not. Non-synchronized transmission designs are used for several reasons. The friction material, such as brass, in synchronizers is more prone to wear and breakage than gears, which are forged steel, and the simplicity of the mechanism improves reliability and reduces cost. In addition, the process of shifting a synchromesh transmission is slower than that of shifting a non-synchromesh transmission. For racing of production-based transmissions, sometimes half the teeth (or "dogs") on the synchros are removed to speed the shifting process, at the expense of greater wear. Heavy duty trucks use unsynchronized transmissions in the interest of saving weight. Military edition trucks, which do not have to obey weight laws, usually have synchronized transmissions. Highway use heavy-duty trucks in the United States are limited to 80,000 pounds GVWR, and the lighter the curb weight for the truck, the more cargo can be carried; with a synchronizer adding weight to a truck that could otherwise be used to carry cargo, most drivers are simply taught how to double clutch, initially, and then most eventually gravitate to shifting without the clutch. In the United States, traffic safety rules refer to non-synchronous transmissions in classes of larger commercial motor vehicles. In Europe heavy duty trucks use synchronized gearboxes as standard. Similarly, most modern motorcycles use unsynchronized transmissions as synchronizers are generally not necessary or desirable. Their low gear inertias and higher strengths mean that forcing the gears to alter speed is not damaging, and the pedal operated selector on modern motorcycles is not conducive to having the long shift time of a synchronized gearbox. Because of this, it is necessary to synchronize gear speeds by blipping the throttle when shifting into a lower gear on a motorcycle. Most modern cars are fitted with a synchronized gear box. Transmission gears are always in mesh and rotating, but gears on one shaft can freely rotate or be locked to the shaft. The locking mechanism for a gear consists of a collar (or "dog collar") on the shaft which is able to slide sideways so that teeth (or "dogs") on its inner surface bridge two circular rings with teeth on their outer circumference: one attached to the gear, one to the shaft. When the rings are bridged by the collar, that particular gear is rotationally locked to the shaft and determines the output speed of the transmission. The gearshift lever manipulates the collars using a set of linkages, so arranged so that one collar may be permitted to lock only one gear at any one time; when "shifting gears," the locking collar from one gear is disengaged before that of another engaged. One collar often serves for two gears; sliding in one direction selects one transmission speed, in the other direction selects another. In a synchromesh gearbox, to correctly match the speed of the gear to that of the shaft as the gear is engaged, the collar initially applies a force to a cone-shaped brass clutch attached to the gear, which brings the speeds to match prior to the collar locking into place. The collar is prevented from bridging the locking rings when the speeds are mismatched by synchro rings (also called blocker rings or balk rings, the latter being spelled "baulk" in the UK). The synchro rings have a sloping engagement so as long as they drag rotationally, they hold the dog clutch out of engagement. The brass clutch ring gradually causes parts to spin at the same speed. When they do spin the same speed, there is no more force on the sloping surfaces of the synchro rings, and the dog clutch is allowed to fall in to engagement. In a modern gearbox, the action of all of these components is so smooth and fast it is hardly noticed. The modern cone system was developed by Porsche and introduced in the 1952 Porsche 356; cone synchronizers were called "Porsche-type" for many years after this. In the early 1950s only the second-third shift was synchromesh in most cars, requiring only a single synchro and a simple linkage; drivers' manuals in cars suggested that if the driver needed to shift from second to first, it was best to come to a complete stop then shift into first and start up again. With continuing sophistication of mechanical development, however, fully synchromesh transmissions with three speeds, then four speeds, and then five speeds, became universal by the 1980s. Many modern manual transmission cars, especially sports cars, now offer six speeds. In some transmissions, it's possible for the input and output components of the mainshaft to be locked together to create a 1:1 gear ratio, causing the power flow to bypass the countershaft. The mainshaft then behaves like a single, solid shaft, a situation referred to as direct drive. Under one possible design, the transmission's input shaft has just one pinion gear, which drives the countershaft. Along the countershaft are mounted gears of various sizes, which rotate when the input shaft rotates. These gears correspond to the forward speeds and reverse. Each of the forward gears on the countershaft is permanently meshed with a corresponding gear on the output shaft. However, these driven gears are not rigidly attached to the output shaft: although the shaft runs through them, they spin independently of it, which is made possible by bearings in their hubs. Reverse is typically implemented differently, see the section on Reverse. Front-wheel and rear-wheel-drive transmissions operate similarly. When the transmission is in neutral, and the clutch is disengaged, the input shaft, clutch disk and countershaft can continue to rotate under their own inertia. In this state, the engine, the input shaft and clutch, and the output shaft all rotate independently. Locking the output shaft with a gear is achieved by means of a dog clutch selector. The dog clutch is a sliding selector mechanism which is splined to the output shaft, meaning that its hub has teeth that fit into slots (splines) on the shaft, forcing it to rotate with that shaft. However, the splines allow the selector to move back and forth on the shaft, which happens when it is pushed by a selector fork that is linked to the gear lever. The fork does not rotate, so it is attached to a collar bearing on the selector. The selector is typically symmetric: it slides between two gears and has a synchromesh and teeth on each side in order to lock either gear to the shaft. If the teeth, the so-called dog teeth, make contact with the gear, but the two parts are spinning at different speeds, the teeth will fail to engage and a loud grinding sound will be heard as they clatter together. For this reason, a modern dog clutch in an automobile has a synchronizer mechanism or synchromesh, which consists of a cone clutch and blocking ring. Before the teeth can engage, the cone clutch engages first which brings the selector and gear to the same speed using friction. Moreover, until synchronization occurs, the teeth are prevented from making contact, because further motion of the selector is prevented by a blocker (or "baulk") ring. When synchronization occurs, friction on the blocker ring is relieved and it twists slightly, bringing into alignment certain grooves and notches that allow further passage of the selector which brings the teeth together. Of course, the exact design of the synchronizer varies from manufacturer to manufacturer. The synchronizer has to change the momentum of the entire input shaft and clutch disk. Additionally, it can be abused by exposure to the momentum and power of the engine itself, which is what happens when attempts are made to select a gear without fully disengaging the clutch. This causes extra wear on the rings and sleeves, reducing their service life. When an experimenting driver tries to "match the revs" on a synchronized transmission and force it into gear without using the clutch, the synchronizer will make up for any discrepancy in RPM. The success in engaging the gear without clutching can deceive the driver into thinking that the RPM of the layshaft and transmission were actually exactly matched. Nevertheless, approximate "rev-matching" with clutching can decrease the general delta between layshaft and transmission and decrease synchro wear. The previous discussion normally applies only to the forward gears. The implementation of the reverse gear is usually different, implemented in the following way to reduce the cost of the transmission. Reverse is also a pair of gears: one gear on the countershaft and one on the output shaft. However, whereas all the forward gears are always meshed together, there is a gap between the reverse gears. Moreover, they are both attached to their shafts: neither one rotates freely about the shaft. What happens when reverse is selected is that a small gear, called an idler gear or reverse idler, is slid between them. The idler has teeth which mesh with both gears, and thus it couples these gears together and reverses the direction of rotation without changing the gear ratio. A reverse gear implemented this way makes a loud whining sound, which is not normally heard in the forward gears. The teeth on the forward gears of most consumer automobiles are helically cut. When helical gears rotate, their teeth slide together, which results in quiet operation. In spite of all forward gears being always meshed, they do not make a sound that can be easily heard above the engine noise. By contrast, most reverse gears are spur gear, meaning that they have straight teeth, in order to allow for the sliding engagement of the idler, which is difficult with helical gears. The teeth of spur gears clatter together when the gears spin, generating a characteristic whine. It is clear that the spur gear design of reverse gear represents some compromises—less robust, unsynchronized engagement and loud noise—which are acceptable due to the relatively small amount of driving that takes place in reverse. The gearbox of the classic SAAB 900 is a notable example of a gearbox with a helical reverse gear engaged in the same unsynchronized manner as the spur gears described above. Its strange design allows reverse to share cogs with first gear, and is exceptionally quiet, but results in difficult engagement and unreliable operation. However, many modern transmissions now include a reverse gear synchronizer and helical gearing. Manual transmissions in passenger vehicles are often equipped with 4, 5, or more recently 6 forward gears in conventional manual transmissions with a gear stick, and up to 8 forward gears in semi-automatic transmissions. Nearly all have one reverse gear. In three or four speed transmissions, in most cases, the topmost gear is "direct", i.e., a 1:1 ratio. For five speed or higher transmissions, the highest gear is usually an overdrive gear, with a ratio of less than 1:1. Older cars were generally equipped with 3-speed transmissions, or 4-speed transmissions for high performance models and 5-speeds for the most sophisticated of automobiles; in the 1970s, 5-speed transmissions began to appear in low priced mass market automobiles and even compact pickup trucks, pioneered by Toyota (who advertised the fact by giving each model the suffix SR5 as it acquired the fifth speed). Today, mass market automotive manual transmissions are essentially all 5-speeds, with 6-speed transmissions beginning to emerge in high performance vehicles in the early 1990s, and recently beginning to be offered on some high-efficiency and conventional passenger cars. Some 7-speed 'manual-derived' transmissions are offered on high-end performance cars, such as the Bugatti Veyron 16.4, or the BMW M5. Both of these cars feature a paddle shifter. Recently, even 8-speed transmissions were being offered, such as in the Lexus IS F.
On earlier models with three or four forward speeds, the lack of an overdrive ratio for relaxed and fuel-efficient highway cruising was often filled by incorporating a separate overdrive unit in the rear housing of the transmission. This unit was separately actuated by a knob or button, often incorporated into the gearshift knob. On a "conventional" rear-drive transmission, there are three basic shafts; the input, the output, and the countershaft. The input and output together are called the "mainshaft", since they are joined inside the transmission so they appear to be a single shaft, although they rotate totally independently of each other. The input length of this shaft is much shorter than the output shaft. Parallel to the mainshaft is the countershaft. There are a number of gears fixed along the countershaft, and matching gears along the output shaft, although these are not fixed, and rotate independently of the output shaft. There are sliding "dog collars" or "dog clutches" between the gears on the output shaft, and to engage a gear to the shaft, the collar slides into the space between the shaft and the inside space of the gear, thus rotating the shaft as well. One collar is usually mounted between two gears, and slides both ways to engage one or the other gears, so on a four speed there would be two collars. A front-drive transmission is basically the same, but simplified. There are only two shafts, the input and the output. Rather that input shaft driving the countershaft with a pinion gear, the input shaft takes over the countershafts job, and the output shaft runs parallel to it. The gears are positioned and engaged just as they are on the countershaft-output shaft on a rear-drive. This merely eliminates one major component, the pinion gear. Part of the reason that the input and output are in-line on a rear drive unit is to relieve torsion stress on the transmission and mountings, but this isn't an issue in a front-drive as the gearbox is integrated into the transaxle. The distribution of the shifters is also a matter of design; it need not be the case that all of the free-rotating gears with selectors are on one shaft, and the permanently splined gears on the other. For instance a five speed transmission might have the first-to-second selectors on the countershaft, but the third-to-fourth selector and the fifth selector on the mainshaft, which is the configuration in the 1998 Honda Civic. This means that when the car is stopped and idling in neutral with the clutch engaged input shaft spinning, the third, fourth and fifth gear pairs do not rotate. In all vehicles using a transmission (virtually all modern vehicles), a coupling device is used to separate the engine and transmission when necessary. The clutch accomplishes this in manual transmissions. Without it, the engine and tires would at all times be inextricably linked, and any time the vehicle stopped the engine would stall. Without the clutch, changing gears would be very difficult, even with the vehicle moving already: deselecting a gear while the transmission is under load requires considerable force, and selecting a gear requires the revolution speed of the engine to be held at a very precise value which depends on the vehicle speed and desired gear. In a car the clutch is usually operated by a pedal; on a motorcycle, a lever on the left handlebar serves the purpose. When the clutch pedal is fully depressed, the clutch is fully disengaged, and no torque is transferred from the engine to the transmission (and by extension to the drive wheels). In this uncoupled state it is possible to select gears or to stop the car without stopping the engine. When the clutch pedal is fully released, the clutch is fully engaged, and practically all of the engine's torque is transferred. In this coupled state, the clutch does not slip, but rather acts as rigid coupling, and power is transmitted to the wheels with minimal practical waste heat. Between these extremes of engagement and disengagement the clutch slips to varying degrees. When the clutch slips it still transmits torque despite the difference in speeds between the engine crankshaft and the transmission input. Because this torque is transmitted by means of friction rather than direct mechanical contact, considerable power is wasted as heat (which is dissipated by the clutch). Properly applied, slip allows the vehicle to be started from a standstill, and when it is already moving, allows the engine rotation to gradually adjust to a newly selected gear ratio. Learning to use the clutch efficiently requires the development of muscle memory and a level of coordination analogous to that required to learn a musical instrument or to play a sport. A rider of a highly-tuned motocross or off-road motorcycle may "hit" or "fan" the clutch when exiting corners to assist the engine in revving to the point where it delivers the most power. Note: Automatic transmissions also use a coupling device; however, a clutch is not present. In these kinds of vehicles, the torque converter is used to separate the engine and transmission. In many modern passenger cars, gears are selected by manipulating a lever connected to the transmission via linkage or cables and mounted on the floor of the automobile. This is called a gear stick, shift stick, gearshift, gear lever, gear selector, or shifter. Moving the lever forward, backward, left, and right into specific positions selects particular gears. An aftermarket modification of this part is known as the installation of a short shifter which can be combined with an aftermarket shift knob or Weighted Gear Knob. A sample layout of a four-speed transmission is shown below. N marks neutral, the position wherein no gears are engaged and the engine is decoupled from the vehicle's drive wheels. In reality, the entire horizontal line is a neutral position, although the shifter is usually equipped with springs so that it will return to the N position if not moved to another gear. The R marks reverse, the gear position used for moving the vehicle rearward. This layout is called the shift pattern. Because of the shift quadrants, the basic arrangement is often called an H-pattern. The shift pattern is usually molded or printed on or near the gear knob. While the layout for gears one through four is nearly universal, the location of reverse is not. Depending on the particular transmission design, reverse may be located at the upper left extent of the shift pattern, at the lower left, at the lower right, or at the upper right. 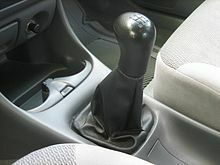 There is usually a mechanism that only allows selection of reverse from the neutral position, or a reverse blockout that must be released by depressing the spring-loaded gear knob or lifting a spring-loaded collar on the shift stick, to reduce the likelihood that reverse will be inadvertently selected by the driver. This layout is reasonably intuitive because it starts at the upper left and works left to right, top to bottom, with reverse at the end of the sequence and toward the rear of the car. The name derives from the up-and-over path between first and second gears. Its use is common in race cars and sports cars, but is diminishing as six speed and sequential gearboxes are becoming more common. Having first gear across the dog leg is beneficial as first gear is traditionally only used for getting the car moving and hence it allows second and third gears to be aligned fore and aft of each other, which facilitates shifting between the two. As most of the gearboxes are non-syncromesh there is no appreciable delay when upshifting from first through the dog leg into second. Though eight-speed transmissions do exist, six forward speeds is widely considered to be the maximum that can be contained within a variation of the "H" shift pattern. In such a case, Reverse is placed outside of the "H", with a canted shift path, to prevent the shift lever from intruding too far into the driver's space (in left-hand drive cars) when reverse is selected. This is the most common layout for a six-speed manual transmission. Most front-engined, rear-wheel drive cars have a transmission that sits between the driver and the front passenger seat. Floor-mounted shifters are often connected directly to the transmission. Front-wheel drive and rear-engined cars often require a mechanical linkage to connect the shifter to the transmission. Historically, four-speed floor shifters were sometimes referred to as "Four on the floor", when steering column mounted shifters were more common. Some cars have a gear lever mounted on the steering column of the car. It was common in some countries in the past but is no longer common today. However, many automatic transmissions still use this placement. Column shifters are mechanically similar to floor shifters, although shifting occurs in a vertical plane instead of a horizontal one. Column shifters also generally involve additional linkages to connect the shifter with the transmission. Also, the pattern is not "intuitive," as the shifter has to be moved backward and upward into R to make the car go backward. However, the column manual shifter disappeared in North America by the mid 1980s, last appearing in the 1986 Ford F-150. But in the rest of the world, the column mounted shifter remained in production, and was in fact common in some places. For example, all Toyota Crown and Nissan Cedric taxis in Hong Kong had the 4-speed column shift until 1999 when automatic began to be offered. Since the late 1980s or early 1990s, a 5-speed column shifter has been made in some vans sold in Asia and Europe, such as Toyota Hiace and Mitsubishi L400. Some transmissions do not allow the driver to arbitrarily select any gear. Instead, the driver may only ever select the next-lowest or next-highest gear ratio. These transmissions often provide clutch control, but the clutch is only necessary when selecting first or reverse gear from neutral. Most gear changes can be performed without the clutch. The pedal goes one step - both up and down - from the center, before it reaches its limit and has to be allowed to move back to the center position. Thus, changing multiple gears in one direction is accomplished by repeatedly pumping the pedal, either up or down. Although neutral is listed as being between first and second gears for this type of transmission, it "feels" more like first and second gear are just "further away" from each other than any other two sequential gears. Because this can lead to difficulty in finding neutral for inexperienced riders most motorcycles have a neutral indicator light on the instrument panel to help find neutral. The reason neutral does not actually have its own spot in the sequence is to make it quicker to shift from first to second when moving. You will not accidentally shift into neutral. The reason for having neutral between the first and second gears instead of at the bottom is that when stopped, the rider can just click down repeatedly and know that they will end up in first and not neutral. This may also help on a steep hill on which high torque is required. It could be disadvantageous or even dangerous to attempt to be in first without realizing it, then try for a lower gear, only to get neutral. On motorcycles used on race tracks, the shifting pattern is often reversed, that is, the rider clicks down to upshift. This usage pattern increases the ground clearance by placing the riders foot above the shift lever when the rider is most likely to need it, namely when leaning over and exiting a tight turn. The shift pattern for most underbone motorcycles with an automatic centrifugal clutch is also modified for two key reasons - to enable the less-experienced riders to shift the gears without problems of "finding" neutral, and also due to the greater force needed to "lift" the gearshift lever (because the gearshift pedal of an underbone motorcycle also operates the clutch). The gearshift lever of an underbone motorcycle has two ends. The rider clicks down the front end with the left toe all the way to the top gear and clicks down the rear end with the heel all the way down to neutral. Some underbone models such as the Honda Wave have a "rotary" shift pattern, which means that the rider can shift directly to neutral from the top gear, but this is only possible when the motorcycle is stationary for safety reasons. Some models also have gear position indicators for all gear positions at the instrument panel. Some new transmissions (Alfa Romeo's Selespeed gearbox and BMW's Sequential Manual Gearbox (SMG) for example) are conventional manual transmissions with a computerized control mechanism. These transmissions feature independently selectable gears but do not have a clutch pedal. Instead, the transmission computer controls a servo which disengage the clutch when necessary. These transmissions vary from sequential transmissions in that they still allow nonsequential shifts: BMWs SMG system, for example, can shift from 6th gear directly to 4th gear when decelerating from high speeds. In the case of the early second generation Saab, a 'Seletronic' option was available where gears were shifted with a conventional shifter, but the clutch is controlled by a computer. Manual transmissions generally offer better fuel economy than automatic torque converter transmissions; however the disparity has been somewhat offset with the introduction of locking torque converters on automatic transmissions. Increased fuel economy with a properly operated manual transmission vehicle versus an equivalent automatic transmission vehicle can range from 5% to about 15% depending on driving conditions and style of driving. Manual transmissions do not require active cooling and generally weigh less than comparable automatics. The manual transmission couples the engine to the transmission with a rigid clutch instead of a torque converter which slips by nature. Manual transmissions also lack the parasitic power consumption of the automatic transmission's hydraulic pump. Manual transmissions also generally offer a higher selection of gear ratios. Many vehicles offer a 5-speed or 6-speed manual, whereas the automatic option would be a 4-speed all the way up to an (more recently) 8-speed. The higher selection of gears allowed for more uses of the engine's power band, allowing for higher fuel economy and power output. This is generally due to the space available inside of a manual transmission versus an automatic since the latter requires extra components for self-shifting, such as torque converters and pumps. Manual transmissions are more efficient than conventional automatics and belt-driven continuously-variable transmissions. The driver has more direct control over the car with a manual than with an automatic, which can be employed by an experienced, knowledgeable driver who knows the correct procedure for executing a driving maneuver, and wants the vehicle to realize his or her intentions exactly and instantly. When starting forward, for example, the driver can control how much torque goes to the tires, which is useful on slippery surfaces such as ice, snow or mud. This can be done with clutch finesse, or by starting in second gear instead of first. An engine coupled with a manual transmission can often be started by the method of push starting. This is particularly useful if the starter is inoperable or defunct. Likewise, a vehicle with a manual transmission and no clutch/starter interlock switch can be moved, if necessary, by putting it in gear and cranking the starter. This is useful when the vehicle will not start, but must be immediately moved e.g. off the road in the event of a breakdown, if the vehicle has stalled on a railway crossing, or in extreme off-roading cases such as an engine that has stalled in deep water. Currently only fully manual transmissions allow the driver to fully exploit the engine power at low to medium engine speeds. This is due to the fact that even automatic transmissions which provide some manual mode (e.g. tiptronic or DSG), use a throttle kickdown switch, which forces a downshift on full throttle and causes the gearbox to ignore a user command to upshift on full throttle. This is especially notable on uphill roads, where cars with automatic transmission need to slow down to avoid downshifts, whereas cars with manual transmission and identical or lower engine power are still able to maintain their speed. In contrast to most manual gearboxes, most automatic transmissions have a free-wheel-clutch. This means that the engine does not slow down the car when the driver steps off the throttle. This leads to more usage of the brakes in cars with automatic transmissions. Manual transmissions place slightly more workload on the driver in heavy traffic situations, when the driver must often operate the clutch pedal. In comparison, automatic transmissions merely require moving the foot from the accelerator pedal to the brake pedal, and vice versa.Manual transmissions require the driver to remove one hand periodically from the steering wheel while the vehicle is in motion. The smoothness and correct timing of gear shifts are wholly dependent on the driver's experience and skill;because the driver selects each gear, it is also possible to select the wrong gear. Attempting to select reverse while the vehicle is moving causes severe gear wear (except in transmissions with synchromesh on reverse when the vehicle is moving backward), and choosing a low gear with the car moving at speed can overspeed and damage the engine. There is a learning curve with a manual transmission; the driver must develop a feel for properly engaging the clutch, especially when starting forward on a steep road or when parking on an incline. Some automatic transmissions can shift ratios faster than a manual gear change can be accomplished, due to the time required for the average driver to push the clutch pedal to the floor and move the shifter from one position to another. This is especially true in regards to dual clutch transmissions, which are specialized computer-controlled manual transmissions. Many types of automobiles are equipped with manual transmissions. Small economy cars predominantly feature manual transmissions because they are cheap and efficient, although many are optionally equipped with automatics. Economy cars are also often powered by very small engines, and manual transmissions makes more efficient use of the power produced. Sports cars are also often equipped with manual transmissions because they offer more direct driver involvement and better performance. Off-road vehicles and trucks often feature manual transmissions because they allow direct gear selection and are often more rugged than their automatic counterparts. Conversely, manual transmissions are no longer popular in many classes of cars sold in North America, Australia and Asia, although they remain dominant in Europe and in Latin America. Nearly all cars are available with an automatic transmission option, and family cars and large trucks sold in the US are predominantly fitted with automatics. In Europe most cars are sold with manual transmissions. Most luxury cars are only available with an automatic transmission. In most cases where both transmissions are available for a given car, automatics are an at cost option, but in some cases the reverse is true. Some cars, such as rental cars and taxi, are nearly universally equipped with automatic transmissions in countries such as the US, but the opposite is true in Europe. As of 2008, 75.2% of vehicles made in Western Europe were equipped with manual transmission, versus 16.1% with automatic and 8.7% with other. In some places (such as the Australian state of Victoria , France , Germany , Sweden , and the UK ), when a driver takes the licensing road test using an automatic transmission, the resulting license is restricted to the use of automatic transmissions. This treatment of the manual transmission skill seems to maintain the widespread use of the manual transmission, as many new drivers worry that their restricted license will become an obstacle for them where most cars have manual transmissions, so they make the effort to learn with manual transmissions and obtain full licenses. Some other countries (such as Pakistan , Finland , Malaysia , Slovenia and Brazil ) go even further, whereby the license is granted only when a test is passed on a manual transmission. Very heavy trucks often use manual transmissions because they are efficient and, more importantly, can withstand the severe stress encountered in hauling heavy loads. Some trucks have transmissions that look and behave like ordinary car transmissions - these transmissions are used on lighter trucks, typically have up to 6 gears, and usually have synchromesh. Although there are many gear positions, shifting through gears usually follows a regular pattern. For example, a series of upshifts might use "move to splitter direct; move to splitter overdrive; move shift lever to #2 and move splitter to underdrive; move splitter to direct; move splitter to overdrive; move shift lever to #3 and move splitter to underdrive;" and so on. In older trucks using floor-mounted levers, a bigger problem is common gear shifts require the drivers to move their hands between shift levers in a single shift, and without synchromesh, shifts must be carefully timed or the transmission will not engage. For this reason, some splitter transmissions have an additional "under under" range, so when the splitter is already in "under" it can be quickly downshifted again, without the delay of a double shift. Today's truck transmissions are most commonly "range-splitter". The most common 13 speed has a standard H pattern, and the pattern from left upper corner is as follows: R, down to L, over and up to 1, down to 2, up and over to 3, down to 4. The "butterfly" range lever in the center front of the knob is flipped up to high range while in 4th, then shifted back to 1. The 1 through 4 positions of the knob are repeated. Also, each can be split using the thumb-actuated under-overdrive lever on the left side of the knob while in high range. The "thumb" lever is not available in low range, except in 18 speeds; 1 through 4 in low range can be split using the thumb lever and L can be split with the "Butterfly" lever. L cannot be split using the thumb lever in either the 13 or 18 speed. The 9 speed transmission is basically a 13 speed without the under-overdrive thumb lever. Heavy trucks are usually powered with diesel engines. Diesel truck engines from the 1970s and earlier tend to have a narrow power band, so need many close-spaced gears. Starting with the 1968 Maxidyne, diesel truck engines have increasingly used turbochargers and electronic controls that widen the power band, allowing fewer and fewer gear ratios. A transmission with fewer ratios is lighter and may be more efficient due to fewer transmissions in series. Fewer shifts also makes the truck more drivable. As of 2005, fleet operators often use 9,10,13 or 18-speed transmissions, but automated manual and semi-automatic transmissions are becoming more common on heavy vehicles, as they can improve efficiency and drivability, reduce the barrier to entry for new drivers, and may improve safety by allowing the driver to concentrate on road conditions. Gear oil has a characteristic aroma due to the addition of molybdenum disulfide compounds. These compounds are used to reduce the high sliding friction by the helical gear cut of the teeth (this cut eliminates the characteristic whine of straight cut spur gears). On motorcycles with "wet" clutches (clutch is bathed in engine oil), there is usually nothing separating the lower part of the engine from the transmission, so the same oil lubricates both the engine and transmission. The original Mini placed the gearbox in the oil sump below the engine, thus using the same oil for both. An Investigation into The Loss Mechanisms associated with a Pushing Metal V-Belt Continuously Variable Transmission, Sam Akehurst, 2001, Ph. D Thesis, University of Bath.